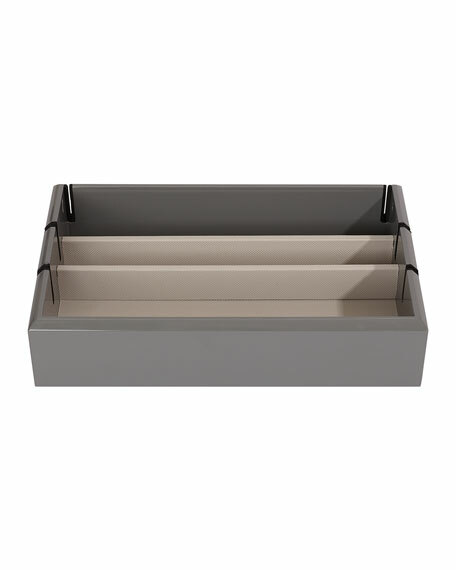 OYOBox Tech Tray organizer in hand-applied lacquered wood with a sleek, modern design. Holds and charges up to 6 devices at once. Handcrafted with seven layers of lacquer. Six cord grooves for easy access to charging cables. Reusable OYOBox carrying tote included. 11"L x 6.75"W x 2.5"D.
UGG boxed gift set includes mixed media trapper hat and gloves. Trapper hat: Lined with dyed sheepskin shearling (Spain). Flaps extend over ears. Snap closure chin strap. Suede trim. Polyester self and fill. All-weather gloves: Leather grip details on palms. Rib-knit cuffs. Polyester self and fill. Imported.